I was recently working with my third year, teacher candidate, students exploring the skills, strategies and dispositions necessary to successfully conduct Internet inquiry within the information-seeking cycle. The information seeking cycle is comprised of (a) planning inquiry questions and forming goals for internet inquiry; (b) generating and revising search terms; (c) investigating search results with a critical eye; (d) locating and transforming information; (e) critically evaluating information; and synthesising and communicating information to others. The students undertook an Internet information challenge, What caused the downfall of the Mayan civilisation?, to develop metacognitive awareness of their own skills, strategies and dispositions when conducting Internet inquiry. What I observed was that some students began this information quest by exploring videos and images relating to the Mayan civilisation. Helen explained the strategy to me, “I usually search for information by looking at videos and images to get the main concepts related to a topic. 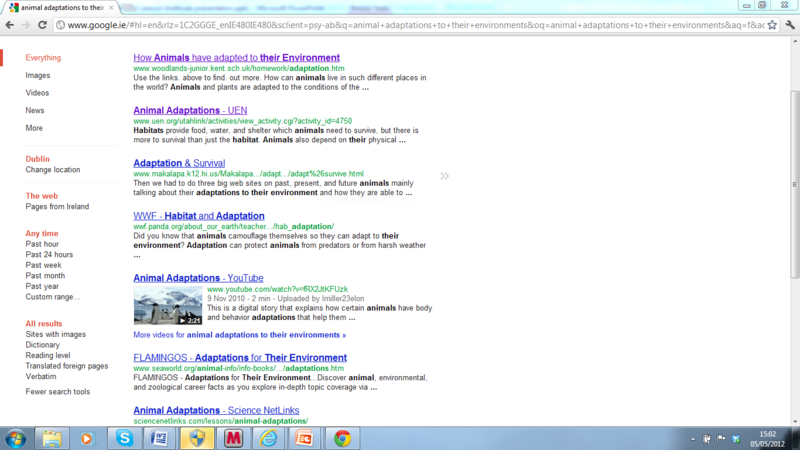 Then I will look up some articles when I have this background information”. Does this strategy represent a shift from privileging text as the primary source of information to favouring more multimodal representations of information? In this blog post I will explore some search engines which provide multiple representations of information. Other search engines privilege a more multimodal, multi-representational approach to presenting information. 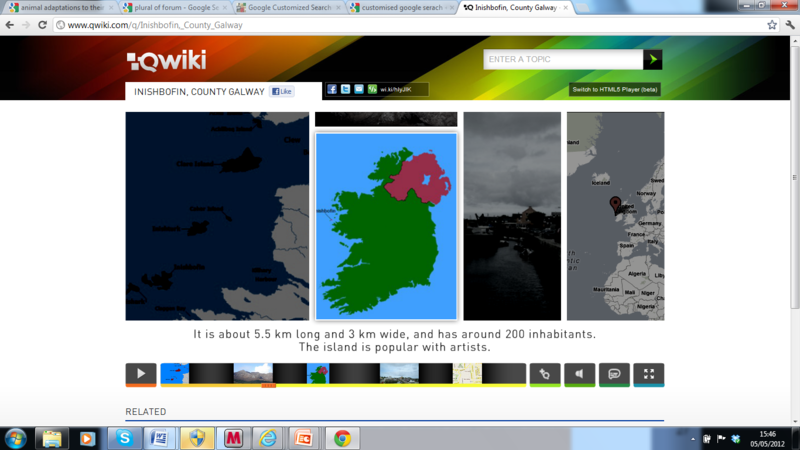 The Qwiki search engine (http://www.qwiki.com ) combines images, infographics, video and voice to enhance interactivity. Some of the pronunciations, especially for Irish place names are hilarious and entertain my students greatly! Qwiki is also available as an app for IPad, IPhone and Android devices. Qwiki Creator has just been released by the Qwiki team in alpha format and is currently available by invitation only. Qwiki Creator allows the user to create their own Qwiki representation with voice, text, images and video. 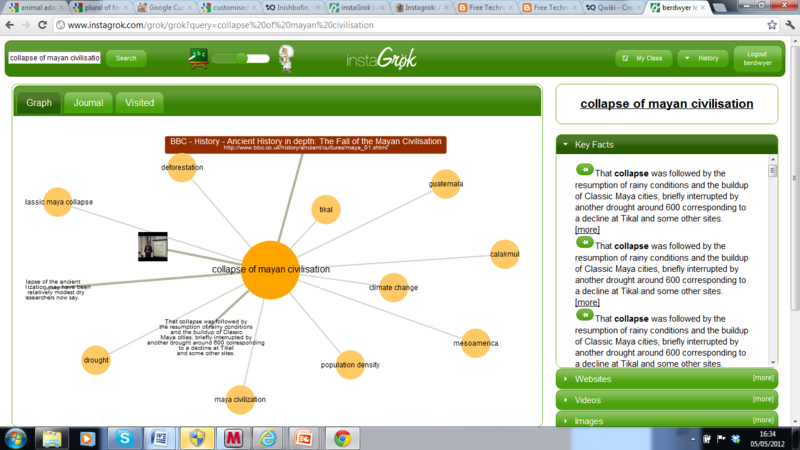 I can see many possibilities for using Qwiki Creator with students in our classrooms. I think it’s certainly one to watch out for. A screen shot from the Qwiki interface is shown below. Instagrok provides both a visual representation and a journal format. Watch the video for an overview. To grok, the developers tell us is to ‘understand thoroughly and intuitively’. Instagrok presents a visual graph of the key concepts related to a topic. You can click on any of the key concepts to investigate that concept more thoroughly. In addition, on the right hand side of the screen, you can view key facts related to the topic¸ web sites, videos, images, and quiz topic questions related to the topic. You can pin any of these representations on to the visual graph. 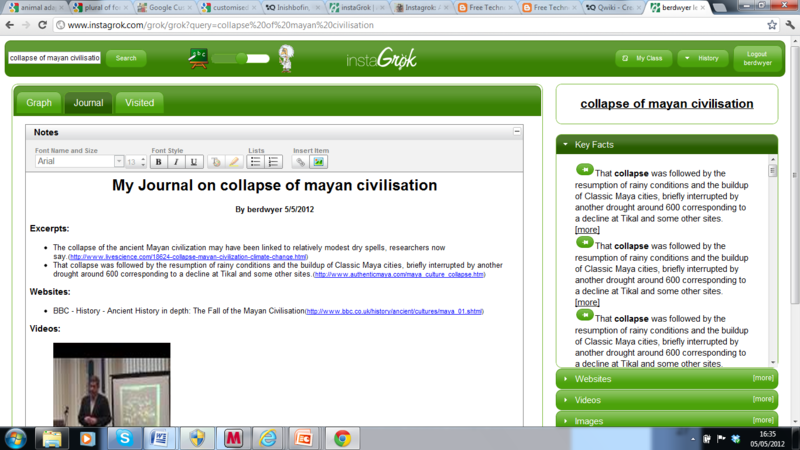 See my screen shot related to a grok I conducted related to the collapse of the Mayan civilisation. There is also a slide bar at the top of the screen to adjust the level of difficulty of the information presented. What really excites me about Instagrok is that you can also create a journal, which is automatically generated, as you annotate the visual graph. See the screen shot of the journal below. As Instagrok allows the teacher to create student accounts you can view the work of students in these journals. So have fun exploring these search engines. Have you noticed any changes in the ways you are searching for information online? Do you privilege text over other formats such as, video, voice or images? What about your students? Do let us know by replying to this blog. I’m eager to explore these new search tools — I tend to rely on Google and can see how the multimodal options could be useful (and perhaps more engaging for some students. my own blog site and noticed your blog post, “Search engines and multimodal representations � literacy beat”, would you care in cases where I really work with a number of of ur tips? Hi Gilberto, no problem. Please do incorporate our tips when they fit your needs.